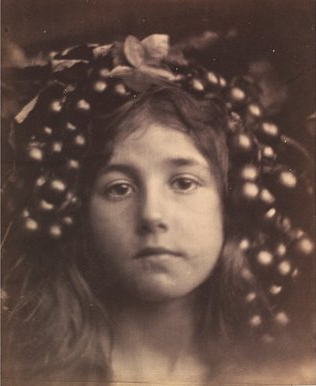 The really interesting thing about Julia Margaret Cameron, the Victorian photographer whose bicentenary we are celebrating this year, is that she was simultaneously old-fashioned and progressive. In obvious ways, her work pointed forward — so far forward that she is still a potent influence today. Yet chief among her ambitions was an equally obvious desire to hark back to an older, better, less modern world. She wanted to turn back the clock. Fascinating. Since this is a birthday celebration — she was born in 1815 and died in 1879 — we should focus first on her call to the future. The V&A has assembled a mighty selection of her pictures for us, more than 100 images, and they tell the story of a strikingly revolutionary career. You don’t need me to inform you how unusual it was in Victorian times for a woman to elbow her way into the art world. Surrounded by bewhiskered alpha males of that especially decrepit Victorian cut, Cameron managed to clear a place for herself at the top table. No other woman artist of her era did that. Her choice of medium was also progressive. Photography was still young when she took it up, looked down on as a medium of documentation. By believing in it so fiercely as a medium of expression, she was way ahead of her time. Also worth celebrating is her age when she took it up. Famously, she was already 48 when her daughter gave her her first camera as a present. All this is impressive. In the V&A’s case, it is personal as well. Many of the best works in this moody parade of unsmiling faces were acquired directly from the artist by Henry Cole, the first director of the V&A, or the South Kensington Museum as it was in Cole’s time. He gave Cameron her first show and a couple of rooms in the museum to use as a studio. So, in yet another pioneering act, she was Britain’s first artist in residence. That is the good news. You’ll notice in the above preamble that I’ve kept it theoretical and not described her work. That’s because her actual photography is immediately and regularly problematic. Just as there are three aspects of Cameron’s career that deserve praise, so there are three aspects that trigger unease. The first and most obvious of these disappointments is the silliness of many of her tableaux: all the dodgy dressing-up going on here. Having bravely decided that photography was a modern art form with an elevated future, Cameron set about turning it into an art form that copied some of traditional art’s worst mannerisms. The Whisper of the Muse, taken in 1865, shows that thunderously melodramatic Victorian painter GF Watts plucking away at a violin while one little girl whispers in his ear and another little girl leans coyly on his arm. The whispering girls are supposed to be classical muses. But in instances like these, the camera really cannot lie, and what you actually have here is two little girls cast in some suspect role-playing with a bearded old man. Cameron’s illustrations for Tennyson’s Idylls of the King are just as ridiculous. No amount of enthusiastic dressing-up can hide the fact that the chap staring madly into the void and clutching his sword as if his life depended on it is an emoting Victorian beardy, not King Arthur. Or that the swooning maidens gathered around his dying body are Cameron’s servant girls, hung thickly with converted curtains. In painting, you could get away with such deceits. In photography, you cannot. Photo after photo here is the result of some desperate rifling though the costume trunk. Also troubling is the sly eroticism of her naked children. In The Turtle Doves, two little girls with their dresses slipped down from their shoulders are kissing and fondling like adult lovers. Barely a child in the show is allowed to keep its clothes on. The explanation for this creepy role-playing is, I believe, fully innocent. Cameron is merely trying to do in photography what countless painters had done before her: imagine little angels and cherubs. But, again, photography has a different relationship to reality from painting. And, in this instance, the results are disturbing. The third problem concerns technical matters. Having come to photography late, Cameron was recurrently prone to technical lapses. Focus issues. Printing problems. The V&A tries generously to present these mistakes as displays of creative freedom, but I found the arguments unconvincing. The first “successful” picture she took, of a young girl called Annie, is actually among her best: in focus, unposed. It’s one of those marvellous photographic occasions when you feel a fleeting moment has been granted eternity. For a brief second, Annie is there again. Elsewhere, however, the images are often blurred, and a sense persists that the intentional “soft focus” she was said to have pioneered was not as intentional as is now habitually claimed. Thus, the first half of this show is an unsteady experience, with lots of frantic dressing-up and much blurry emoting. As the “Victorian Cindy Sherman”, Cameron is rightly held up as a pioneer of the identity-hopping branch of modern photography. But the fact that her chief aesthetic mentors were Watts and Tennyson tells you all you need to know about her motivation. Outside her window, Brunel was building iron bridges and the smoke of the industrial revolution was blackening the social fabric of Britain. Inside her studio, King Arthur lived on and the Greek tunic was the daywear of choice. Thankfully, the second half of the exhibition tells a finer story. In 1865, she started using a bigger-plate camera, and the larger format seemed to cure her of some of her addiction to fussy artifice. In particular, the large, spare portraits of female faces she began taking are marvellous. Julia Jackson, the mother of Virginia Woolf, stares thoughtfully sideways in a beautiful oval. Elsewhere on the wall, the same model turns fully to us and penetrates us with such a fierce stare. Plucked out of their silly costumes, the men, too, are improved by Cameron’s new austerity. Darwin, in a frock coat, looks out intently at an unseen horizon. Tennyson, mad hair flapping, has a face criss-crossed with so many wrinkles, bulges and blood vessels, it would work flattened out as a map. Cameron was always striving for depth. That’s what all the costumes were about. But only when she discarded them did she finally find it. Elsewhere at the V&A, a gorgeous exhibition devoted to Richard Learoyd brings some of Cameron’s concerns up to date. Learoyd’s work is also concerned with identity issues and technical exploration. He uses a room-sized camera obscura, and every one of his photographs is a unique print. The best ones feature nothing more complicated than a single model, often naked, always lost in their own world. This dreamy atmosphere is emphasised by the camera obscura technique, which gives every image a sense of heightened reality: reality on the edge. Wonderful.